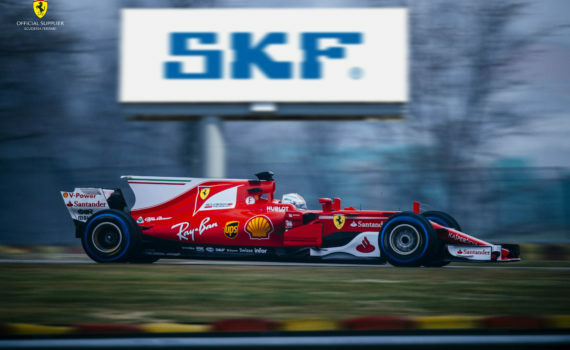 The 2017 Formula 1 season just started, and SKF is right at the heart of it again, extending its long association with Scuderia Ferrari. SKF will supply a range of specialist products as well as its design and validation expertise to the Italian motor racing giant. Under the agreement, SKF will supply all customised products that fit into the chassis, such as wheel bearings and plain bearings. At the same time, it will supply a broad range of products for the engine and gearbox – including cylindrical and needle roller bearings, deep groove and angular contact ball bearings and hybrid products. The SKF bearings provide top end performance: special materials – such as high speed and high temperature steel – as well as special coatings and other complex features all contribute towards meet the exacting standards of Formula 1 components. Some of the materials, including ceramics, special steels, lubricants and coatings, are still under development in SKF’s R&D centre. In addition, SKF will supply Scuderia Ferrari with testing facilities in order to improve factors such as condition monitoring.